Centred in an orbiting universe, with Brad, the brood and her humanitarian efforts all floating in a gravitational pull, a mere mention of her name calls for hushed tones of veneration. Simple and elegant in black cardigan and top, her hair loose around her lithe shoulder, she beams and coos speaking about her first film in four years. Oft voted Disney’s most petrifying villain, Jolie was born to play Maleficent, the tainted, evil fairy queen who places Elle Fanning’s saccharine Sleeping Beauty in a solid slumber. In resplendent humour, she talks of her joy at playing her new role, he children’s involvement, next directorial effort, Unbroken, plans to work with Brad and why she’s potentially leaving Hollywood for good. You seem so calm and relaxed at junkets? Are you inwardly nervous at all? JOLIE: I get nervous when I have to make a speech, terribly nervous at things like that. But talking about films and these kind of things, I tend to be quite relaxed. But it’s also been nice, everybody’s been quite nice, because sometimes you get very stressed and sometimes people can be aggressive but it’s been alright so far. As long as you’re nice and don’t ruin my experience. This character is described as the most iconic Disney villain. 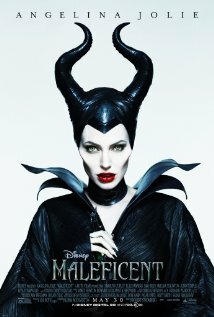 What is it about Maleficent that has carried though five decade, so much so that she can sustain a brand new feature? JOLIE: I don’t know, I just found her so, the original was so well drawn, the actress had such an extraordinary voice and something about her just seemed so powerful and elegant and she seemed to enjoy really being evil, which I think is fun to watch. I think I think it’s funny that people think she’s the worst Disney film, we’ve had discussions about this on set about why? There are so many great villains and yet why do kids vote her the scariest? We talked about maybe it being a mother issue, you know, the thing that its supposed to be the woman who’s supposed to make the kids feel safe. Or the fact that she does the worst thing, she curses a child? I don’t know but it’s been really fun to explore and I think what was most interesting, that there was so much left out of the animated feature, that she was actually a fairy so it wasn’t reinventing her, it was actually going back to the original fairytale and going back to what was missed. Do you think she’s an empowering role model for little girls? JOLIE: Ummm [laughs] maybe Elle would be a better role model. But you know, I thnk there is something about her that people will relate to. I think all people, little boysm little gisl and adults. She’s somebody who wasn’t born evil, she had a real strong sense of justice so when she was younger I’d say then she was definitely a role model. bUt then she’s abused and I think we’ve all had something happen in our lives that’s made our walls go up. Less trusting and more angry and it’s what you do with that and she makes the absolute worst choice by taking it out on someone who’s completely innocent. And then she has to live with that and how she comes to terms with that, is interesting and for anybody, espeiclaly for children who’ve felt bullied or like outsiders, felt ashamed of themselves, they will identify with her. What was that moment for you that saw the walls go up? Would you like to share it? JOLIE: I can, I don’t really want to share it but I’ve had a few. What shaped your moral compass? Why choose your next directorial topic to be centred round Louis Zamperini? JOLIE: Louis’ story and his book, through Lauren Hillenbrand, great writer and lady, has been inspiring to so many people and it was inspiring to me and it made me kind of feel, this is a man who faced so many challenges and he met those challenges with strength of will and faith and love of family and he evolved. He wasn’t perfect, he was actually a real troubled kid but he became a great man and I think there’s a message in that for everybody that we can grow and become better people and we can rise up. And I wanted to tell a story for people that they can feel good about. Something to be inspired by. One of the recurring themes in Disney films is youth, and youth is like a virtue and I wondered what your attitude is to ageing and if you feel now, as a mother, if you feel more comfortable in your skin now than you did in your twenties? JOLIE: certainly, I think everyone who gets older feels more comfortable. I love getting older. I love being a mom and I certainly feel the older that I get, I learn more and I just feel more evolved. JOLIE: Yea, in my life, and in my work, I am a person, and when I’m on set, and esepciallyu when I’m directing, I’m Angie, I’m working, I’m a mom and a friend. Will there come a time when you walk away from showbiz altogether? Do you have a date in mind? Is it must be strange to from Hollywood to your work with the UN and back again? JOLIE: It isn’t because I wake up as a mom and I read the paper and I get on the phone and learn about what is going on with UNHCR. And I go to work and most of my work deals with the issue I believe in. Soemtimes its pure entertainment, like Maleficent and I get time to spend with my children, but it’s from a similar place. But its’ not my passion as much as, I will naturaly…I didn’t realise I hadn’t been in a film for four years, I hadn’t even notice. But I don’t have enough confidence to know that I could leave altogether and make a real change, I will do more and more naturally, but whether I will change professions and do something more substantial and assume a role, I don’t know. Will you ever direct Brad? JOLIE: I don’t know, I would love to. But you’re going to work together again? JOLIE: We’re thinking about it, I wrote something a few years ago, and so we’re thinking about it. Cate Blanchett once said working with Brad was like ‘chocolate’. How would you describe working with Brad? JOLIE: I don’t know [laughs] We haven’t worked together in ten years but when we did, it was so much fun. But we weren’t together at the time, so it would be very different now. But when I worked with him, I realised he was my best friend, we had so much fun and he really is a great man. Did your other children get jealous of Vivian? JOLIE: They were there and they think it’s hysterical that she’s in the movie, they’re the ones who like it the most. JOLIE: Zahara and Pax are in that moment at the christening. I always remember growing up, I thought this is this big iconic moment I’m creating in Disney history so that when they look back with their kids, they can share it with them. I honestly, I needed them, my performance is better when they’re in the room. I entertain them. Whatever I did, if I knew it was making them laugh, it got broader. How do you keep them grounded with this crazy Hollywood lifestyle? JOLIE: They travel a lot with this and we don’t just live in Hollywood, we go to other places and some of them join me on my UN trips and we go to Cambodia. We dno’t just live in one world. We don’t keep them from the things that we’ve beem blessed to have but we want to make them aware of the world around them but also, can be as comfortable without when we travel to other places. When do you take time for yourself? JOLIE: I always joke about that, when I go into the field, I was in Libya, when it was all coming to an end. I remember thinking, ‘it’s quiet’. Oddly when I go to a warzone, it’s my time to reflect on life and I say that not because it’s peaceful but because it’s very soul enriching. Do you regard yourself as a role model? JOLIE: I wake up and I try to be the person I try to be and I’m proud of the choices that I’ve made at this stage of my life and I know when I go to sleep at night I’ve done things for the right reasons and I’ve been the best mother and person I can be. And if that translates in any to being a good role model, I’m happy. But I make choices for what I think is genuinely think is right.